Are Psychic Predictions Set in Stone, or Can I Change My Future? Psychics have a rich history beginning in ancient Egypt. And tarot cards? They first gained popularity in medieval Europe. Humans’ fascination with new agey practices has continued to grow. Psychic readings are even a central theme in the massively popular Game of Thrones series. Few fans could forget when a young Cersei visited a witch named Maggy the Frog, and was told how her future would unfold. Fans of the books and television show know that she’d spend her entire life avoiding her prophecy, but was she right to do so? If you’re ready to dip your toe into spiritual development, check out these frequently asked questions that’ll shed some light into the topics—no crystal ball needed. In a word (or two), kind of. Of course, this all depends on each psychic’s abilities, but a good psychic doesn’t just see one future, they see multiple outcomes. International speaker, author, and modern mystic, Belinda Davidson, said that she sees several “possible future realities” when examining people’s energy fields, and it’s her job to empower her clients to make the decisions that would best support their ideal situation. Psychics can see multiple outcomes, but Davidson affirms that the future is in our hands. Everyone has a destiny, but does that mean none of our actions matter? Intuitive meditation teacher Brad Austen says absolutely not. When it comes to destiny, there are 2 main schools of thought: One belief maintains that we create our own destiny every day through our belief systems, thoughts, and actions. The other believes we created our destiny before we were born. Austen believes in a combination of the 2 schools; everyone has a rough plan created in the spirit world before we incarnate, but we also possess free will and the ability to create the life we want. Do we have free will to change our fate? There’s no straightforward, simple path toward your fate, destiny, or karma. Our outcome isn’t set in stone. Thanks to our free will, we hold all the power when it comes to making decisions. That means whatever circumstances we face, our attitude and choices determine the outcome, instead of a predestined path. One way to assess whether we are on the right path, however, is to tune into ourselves and see how we react to a situation. If you’re feeling positive, hopeful, or energized, it’s a sign to keep moving in that direction. But if you’re experiencing anxiety, feel discouraged, or negative, it’s time to reassess. What happens if you’re given a prediction you want to change? The next time you seek a psychic’s insights, remember this; readings are supposed to focus on guidance, empowerment, comfort, and support. One advisor at Kasamba, an online psychic tool, says that psychics are meant to reveal truths we know deep down, or realities we either haven’t thought of yet or realized. In the end, it’s up to us to make decisions about our own paths. Fortune telling is meant to help you see where your life is going, but they’re not absolute truths. Psychics are able to see several possibilities regarding your future and you have the power to make decisions and explore different paths. 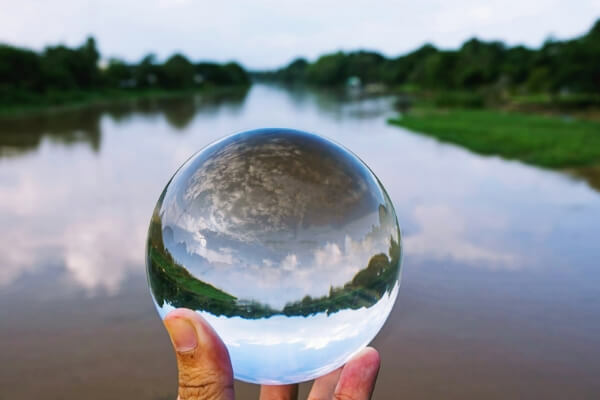 Each prediction is meant to illustrate the future of a specific scenario, but it’s always adaptable and possible to impact the future. So can psychics or tarot cards really predict the future then? Readings are a way of knowing where you are in that moment. When the reader feels your energy, they’re able to see a few ways your situation can play out. That doesn’t mean that you should research the best psychic and follow their word blindly. No matter what reading you recieve, check in with your intuition and see which scenario best feels like it could apply to you. The same principle applies to tarot cards. There will always be a little uncertainty, but reading tarot is a great opportunity to sit with those feelings and refine your intuition. Let the keywords serve as guidelines for the card’s meaning, and after looking at the card name and design, dig down deep and see what it means to you. Psychics and tarot cards are meant to make people aware of several possibilities and paths to take on their journey toward their true desires. A good reader should leave you feeling empowered, positive, and well-informed. Just remember that no matter how amazing their reputation, their word isn’t law. Our thoughts, beliefs, and behaviors create the life we live each day. We all have control over our fates. Psychics and tarot cards are tools through which we can assess where we are in this moment, take a step back, listen to our intuition, and examine the path we want to take to get us to where we want to go.